After church this morning Tim and I packed up a lunch and headed for the hills. We wanted to take advantage of a day without rain. A 10-minute drive takes us to Tod Gowland Park which sprawls along the Saanich Inlet. After an hour on the trail we stopped for lunch, eating our bread, cheese, hardboiled eggs and date loaf while drinking in beautiful scenery. Materfamilias recently posted about the fauna she encounters on her runs around her island. So I determined to notice what I might see in the way of wildlife. The count didn't begin auspiciously - my first sighting was of a dead crow, partially eaten, beside the trail. Then, I fished a gnat out of my tea mug. Things were not looking good in the wild creature department. I did notice seagulls, white dots against the blue water, and later, a native red squirrel dashing along a tree limb. But that was about it, although I did hear plenty of crows rasping harshly in the forest. Misty, distant islands beckon when we turn away from the inlet to the waters between us and the mainland. These are the waters and islands we travel through on the ferry. To me, today, they looked magical, like something from Narnia, full of mystery and adventure. Another hour took us to Jocelyn Hill. Tim snapped a quick photo of me with my walking stick. We each have one. Tim's father made them, and when he passed away, we each asked for one. They have never been used, until today. We both found that walking with a stick gives our upper bodies a bit of a workout. And going down steep sections of the trail, I found I had better balance and could travel faster, using the pole as a brace. 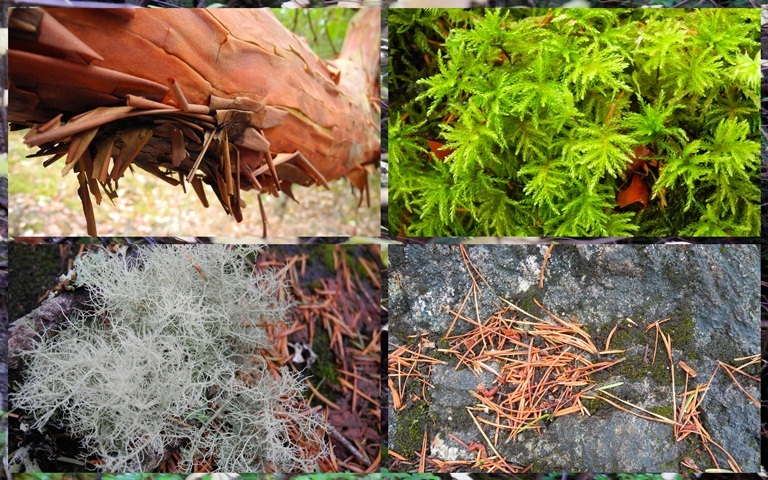 Here is some of the minutia I noticed on the trail - thin, curled shreds of arbutus bark, soft and fine bright green moss, a tangle of silvery moss on the trail, and a collage of fir tree needles. Thirteen kilometres of hiking up and down makes for very tired feet. This evening, I'm happy to just sit and read blogs. And for anyone who heard about the earthquake in our area, we are fine. No tsunami, no shaking. We were sitting on the couch at the time it happened and didn't feel a thing. And I'm thankful. Meanwhile, we are thinking of all those on the east coast in the path of Hurricane Sandy. It says my comment, the one I have not yet made, has been saved. This should prove interesting as I have been having trouble commenting at Mosaic Monday. I made it halfway through the list and decided to go to the end, which is where I've found you in Narnia. Oh my, Lorrie! It's so beautiful there. I don't wonder that you're out walking all those miles...over 8! Yes, I had to check. Great photos and I especially love the one of you above the view and carrying your walking stick. Wow...8 miles (thank you, Vee! ), particularly in mountainous terrain, is quite a hike! I am sooooo impressed! Great job of noticing things! My hubby is so patient with me as I examine most everything we see along our walks--just in case it might be picture-worthy! What a treasure to have those walking sticks from Tim's dad. Great photos of our beautiful BC (and you, too). That was a beautiful walk. We went along Colquitz Creek this afternoon, just for a change, and it was beautiful. I noticed all the berries - rowan, mountain ash, rose hips - lots of red! Lorrie, how wonderful to have Tod Gowland Park such a short distance from where you live. The scenery is amazing, those wonderful trees and the lake as you say looks almost mythical. Your mosaic of the moss, pine needles, bark and greenery is magical! What a beautiful place for a walk. I love the shot of you with your walking stick. The scenery is gorgeous. So glad you were not affected by the earthquake. Lovely photos, have a happy week ahead. aww such a lovely walk..
What stunning views! I'd be out walking ever day I think! Love the beautifully carved stick and I guess you'd feel that your father in law was with you on your walk carying his wonderful work? Paying attention to details enriches our lives. And what a view! Sounds like a wonderful afternoon! fantastic views. It sounds like a wonderful place for a walk. It is coming into summer here now, and definitely not the time to go bush walking. We have walking poles. They certainly make the walking easier as we swing along, especially if carrying a pack. Thanks for stopping by my blog today, and have a wonderful week. A day without rain was perfect for such a bracing hike. I think i'd really have appreciated a walking stick on a hike like that. Now i'll have to google the park...you're taking me places I've never heard of before. Enjoy your week Lorrie! Thanks for the mention, Lorrie. What a gorgeous hike you took those beautiful walking sticks on! I'd say that native red squirrel was a good fauna find, even if you were disappointed in the amount of wildlife you came across. A researcher in an office above mine has been following the spread of the Eastern grey squirrels, and I cross my fingers that we'll have any of our own little guys left in a decade or two. It's wonderful to glimpse them in their own environment. What a great little jaunt! Gosh, that is incredible scenery in your part of the world. Had to laugh about the gnat being on your critter count! Love the hiking stick - functional AND beautiful. I use a stick whenever I am ambling over non-level ground. That way I can always have 2 points down at all times (a foot and a stick) and keep my balance. It also takes some weight off of my leg with the bad knee (used on the opposite side). One piece of advice about hiking sticks - don't use the strap while you're walking, but only when you are stationary. If you fall and the wrist strap is on, you can easily break your wrist. A mountaineer taught me this little trick. What a pretty view with the mountains in the background. Thanks for sharing your walk with us. The pretty walking stick is a real treasure to use during your walks/hikes. Wow - that was a good size quake. I was not aware of the earthquake up your way until last night - glad you and family are all ok.
What a fabulous place to hike! The scenery is breathtaking. I had to read outloud your nature sightings...I laughed out loud when I read about the gnat in your tea cup. So then I read it all so hubby would know why I laughed. It sounds like the perfect day and you look so pretty! Blue is your color! A beautiful place to hike! Thanks for taking us along...and sharing the 'forest minutia' with us all. Love your walking stick! Glad to hear you are fine and that you had no earthquake or tsunami damage! Your mosaic of forest minutia is very interesting. It's fun to see what you can find in nature if you really look. I'm glad you suffered no ill effects from the earthquake. I'm sorry it's taken me this long to visit your blog from Mosaic Monday, but I really appreciate your visit and kind comments. I hope you have a wonderful week!